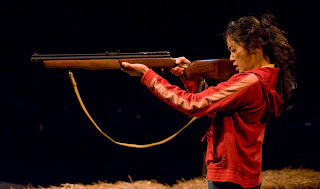 Teresa Avia Lim portrays the titular character in Edith Can Shoot Things and Hit Them. Edith Can Shoot Things and Hit Them is a sweet coming-of-age story set somewhere in early 1990s mid-America. 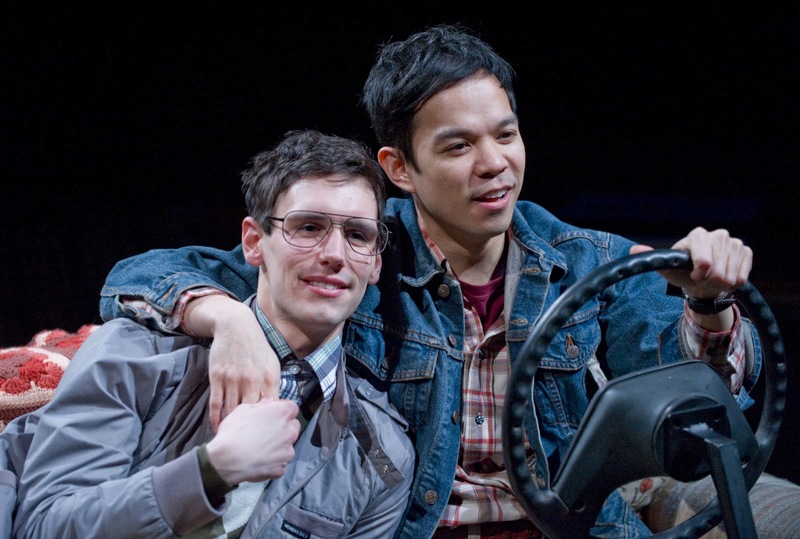 Playwright A. Rey Pamatmat has doubtless drawn from his own feelings about being a gay Asian-American latch-key kid growing up on a farm in rural Michigan in creating the situation for his three characters. The first person we encounter is twelve year old Edith, played with subtlety and humor by Teresa Avia Lim. Edith, accompanied by her large stuffed frog, prowls the farm like a feral cat protecting its territory, which includes her 16 year old brother Kenny, played by John Norman Schneider. Together, brother and sister live in their abandoned family home–an isolated farm somewhere in flyover country, sans parents or adult intervention. Enter Benji, played by Cory Michael Smith. The same age as a Kenny, Benji lives a more mainstream version of the American dream with dad and mom at home, chores, and church. The only sophomores in pre-calculas class the become friends and are eventually drawn together as lovers. Bereft of role models these bookish boys search for answers in comic books, the dictionary and medical texts. Originally Pamatmat thought he would pursue a career in acting, but found few parts for Asian men outside the stereotypical. A class assignment led him to create his own opportunities, which he now shares with others. In an interview with Mik Mrocynski published in Inside Actors 35th Humana Festival of New American Plays Pamatmat discussed his predilection for ensemble casts. Edith follows this style giving equal voice to the needs and input of each character. 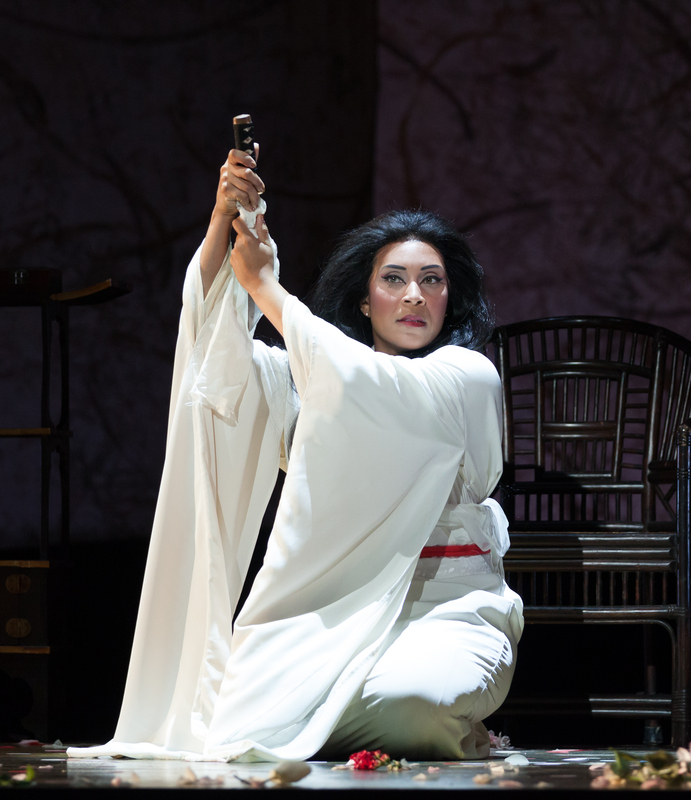 Director May Adrales and her design team have exploited the opportunities afforded them by the Bingham theatre’s ovular configuration. By fixing home-base solidly in the center of the stage, as it is in the psyches of the characters, Adrales frees the peripheries for exploration of self and the world outside. Though Pamatmat’s characters face a number of potentially overwhelming situations including the physical loss of a parent and abandonment by the other, conflicts and confusion over emerging sexuality, betrayal, and the dread of absolute freedom; Kenny, Benji and Edith meet and overcome each obstacle with a Matheresque frown and a quick epiphany that allows them to move serenely onward. In this A. Rey Pamatmat is a kind of neo-expressionist–less concerned with problem solving and more interested in the internal development of his characters. On the surface nothing much has changed at the end of Edith Can Shoot Things and Hit Them. Internally, however, Kenny, Benji and Edith have grown substantially in their understanding of themselves and their place in the world. They have established a new balance of power with the world outside and come to a true understanding that to choose inaction is itself an action with consequences. The cast of this show are to be congratulated on their fearlessness and nuanced approach to the script. The opening night audience was clearly won over by their brilliant performance and I anticipate a strong run. If you don’t already have tickets for Edith Can Shoot Things and Hit Them you had better get them quickly. 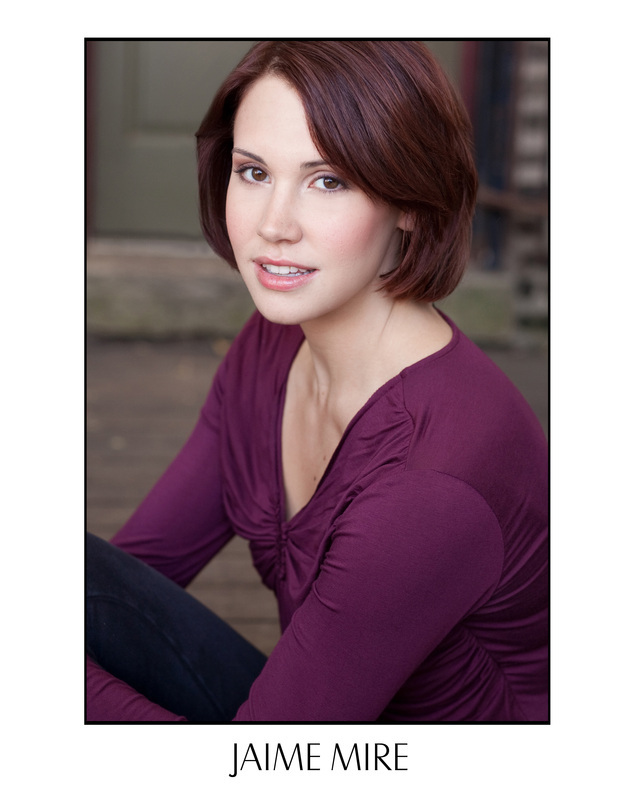 Call 502.584.1205 or go to www.actorstheatre.org. Cory Michael Smith (L) and John Norman Schneider (R) creating the roles of Benji and Kenny in A. Rey Pamatmat’s Edith Can Shoot Straight and Hit Things. At Actors Theatre of Louisville through April 2 as part of the 35th Annual Humana Festival of New American Plays. Photo by Michael Brosilow, 2011.